IMF Tax Tribunals Coming to America Soon? In Greece, the bankster loan sharking operation popularly known as the International Monetary Fund has proposed creating special courts and tribunals to prosecute tax evaders. Greek’s finance minister, George Papaconstantinou, a socialist Bilderberg member and a graduate of the London School of Economics, has “suggested the effective management of whistle-blowing” to protect people who rat out tax scofflaws. 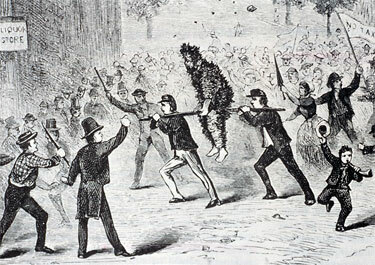 Once upon a time, federal officials were tarred and feathered and run out of town on a rail in response to confiscatory taxation. Illustration: Western Pennsylvanians protest a tax on whiskey in 1794. “The idea of tax courts concerns either the setting up of special tribunals that would deal with tax cases without having to go through normal courts or the appointment of an adequate number of specialized judges to the existing structure of administrative courts who would deal exclusively with tax cases,” reports Kathimerini, a supplement to the International Herald Tribune in Greece. The IMF also calls for “exhaustive checks regarding the payment of value-added tax.” Bankers and their cronies in government love the VAT because it legalizes theft at every stage of product manufacture and distribution. It disproportionately raises taxes on middle- and low-income earners. It is a sledgehammer used to wreck societies. It will get ugly in Greece because the banksters will not get blood out of a stone. Austerity of the sort now imposed on Greece erodes tax revenues. But then the plan is not to raise tax revenue. It is to destroy nations and usher in world government. Greece went crawling to the globalist loan sharking operation after its economy was imploded through a “monetarist” debt policy. In other words, after Greece joined the eurozone bankers manipulated the country’s money supply and then destroyed the supports with hedge funds and other bankster speculation schemes designed to level national economies. In April, Greek’s socialist government begged the EU and the IMF for high interest loans. The following month the IMF made demands for “austerity measures” — slash and then freeze public-sector wages, raise taxes, increase value-added taxes, impose new taxes on businesses, cut pension payments and raise retirement ages — in order to pay back the loans issued at high interest and thus impoverish the average Greek. Soon thereafter, the planned IMF riots occurred in Greece with predictable result, including death. Monetary and fiscal austerity are designed to implement privatization and so-called “liberalization,” a nice word for removing restrictions on the inflow and outflow of international capital as well as restrictions on what transnational corporations and banks are allowed to buy, own, and operate in foreign countries. Banksters accomplish this by stacking up debt and then demanding “structural readjustment” that results in fire sales and the selling off of national treasures and assets to the bankster vulture class. In June, the Greek government put some of its 6,000 islands on the market. “Debt is an efficient tool. It ensures access to other peoples’ raw materials and infrastructure on the cheapest possible terms,” writes Susan George in A Fate Worse Than Debt. “The huge multinational banks and corporations in particular love the IMF,” writes Ron Paul. “Big corporations obtain lucrative contracts for a wide variety of construction projects funded with IMF loans. It’s a familiar game in Washington, where corporate welfare is disguised as compassion for the poor.” Most “recipient nations face huge debts they cannot service, which only adds to their poverty and instability,” Paul adds. According to the IMF’s calculations, the United States finished 2009 with a debt-to-GDP ratio of 85%. “The current trend projects the United States to finish 2010 at 94% and 2011 at 98%. The 90% level has become the IMF’s make-or-break point for countries hoping to grow their way out of debt. If the government debt load climbs above 90% of GDP, economic growth slows so much that growth is no longer a viable solution for reducing that debt, and the IMF insists on austerity measures,” notes Activist Post. It looks like austerity measures and new tax schemes are in the works for America. Glenn Beck and the RINO intelligentsia are all for squeezing more money out of the workers to pay off a never-ending bankster debt. Beck is in agreement with the former Fed mob boss Paul Volcker and Obama’s Goldman Sachs dominated Economic Recovery Advisory Board. It is our duty to pay the bankers. It looks like, as well, the U.S. will ultimately get the same sort of tax courts and tribunals the IMF proposes for Greece since there is no shortage of tax scofflaws in America and no shortage of state-worshiping bureaucrats eager to fill the prisons and coming-soon slave labor penal workhouses with a fresh crop of victims. Midas Resources is your source for gold and silver sales. Midas is now offering American Buffalo Gold Bullion Coins, the first .9999 fine 24-karat gold coins ever struck by the United States Mint and offered for sale through a network of Authorized Purchasers. These $50 gold coins are available to members of the public seeking a simple and tangible means to own and invest in 24-karat gold in the form of legal tender coins whose content and purity is guaranteed by the United States Government. Call Midas Resources to get the American Buffalo today at 1-888-294-6187 and tell them you heard about it from Alex Jones or order it here, now.